FUN Source is a hl2 mod. It combines action-packed multiplayer gameplay with crazy weapons and game modes. This is not just your run of the mill "Half Life 2 Deathmatch with extra machine guns, maps, and characters", this will be unique. We are aiming for creative game modes, weapons, and content. While we will have deathmatch, team deathmatch, capture the flag and the like, we will have many unique game modes. We have come a long way since we started and we feel that the mod is really starting to take shape. Whilst visual aspects such as the HUD and textures are not nearly perfected, we have a great chunk of our gameplay aspects and coding completed. Lately, we have been finalizing some of our newest weapons and features. We now have completed the CD-R Gun, which fires lovely blank (or Barbie Horse Adventure) discs out of the drive, cutting people with its circular awesomeness. We have also completed the model for the weapon pickups and other miscellaneous ground items. On the Programming side of things, the mod has been greatly shaping up. Brush vehicles are now 100& (or 99.9% - still working out a few kinks) completed. You can create now add the "vehicle_seat" part to anything your making in hammer to have a nice drivable vehicle. Who doesn't want to drive away in a custom trash-barrel car-o-death? Also, depending on stance and velocity, the crosshair will expand and contract meaning that your more accurate shots will be placed when crouching and not moving! Bullet spray will vary with stance and velocity as well. There are also separate binds to throw the different types of grenades now. For example, two enemies are in a room, pop in a PhysNade with your x button and throw and Incinerator in with your z button and watch Physics and Fire combine! Mapping has been slowly progressing into some good stuff. 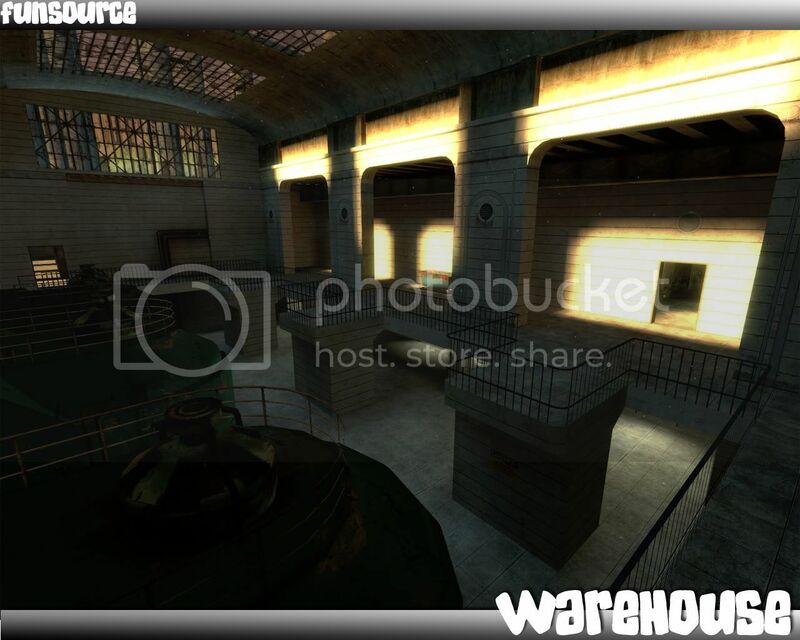 Our map fun_warehouse has been updated and further improved. 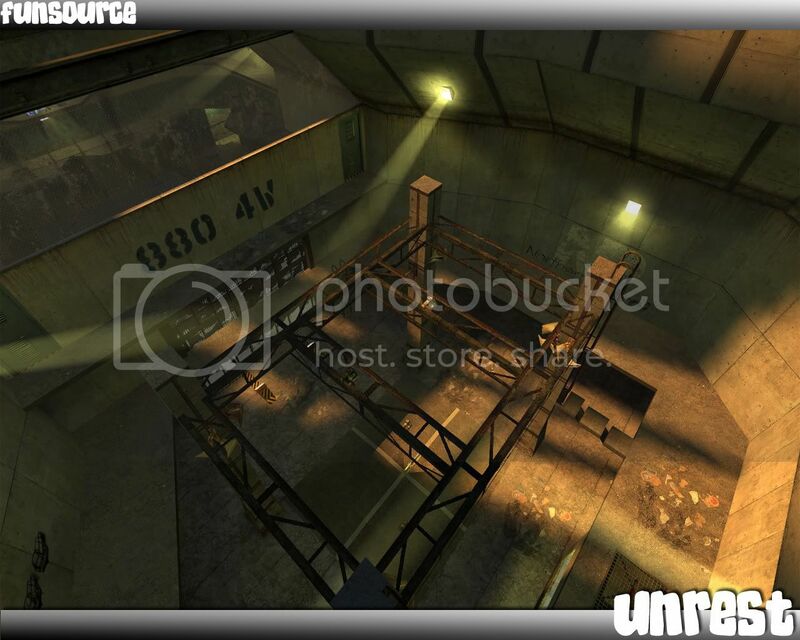 Another map fun_unrest has been updated as well. A currently-unnamed map has been created. Our Wall Jump Tower has been completed and a completely working and destructible Amusement Park is in the works. 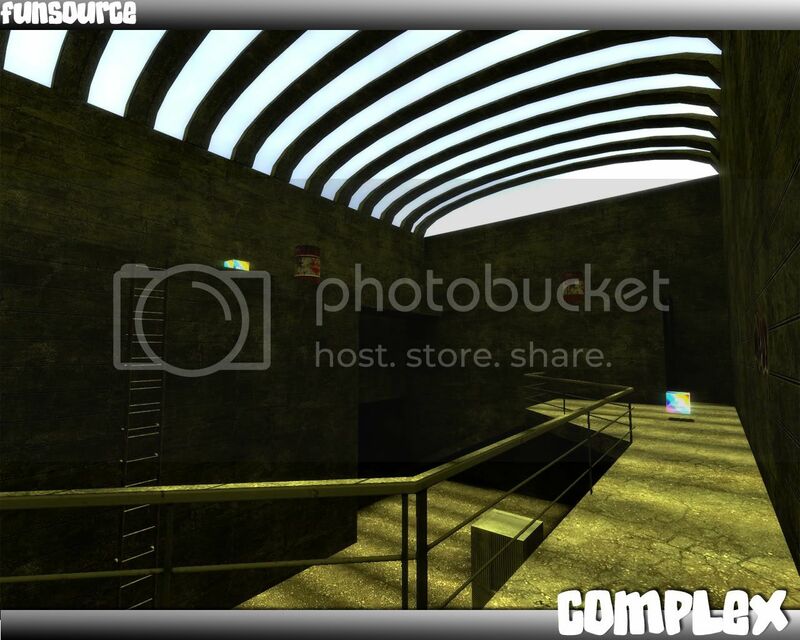 Another currently unnamed DeathMatch map is also in the works. All-in-all, the mapping team has been hard at work trying to get some good maps ready for our Alpha, which may be coming sooner than you expect! Amongst all of this added and updated content are bug fixes as well. We have tweaked our weapon pickup system and fixed many gamemode bugs and glitches. Also, as always, we are always looking and welcoming new team members. So please if you would like to contribute in any way, shape, or form to FUN Source, then please stop by our forums and apply! In the mean time, enjoy these fresh new pics for you to gaze on until our next update! BOO you killed my widdle fun game Im gonna getcha! Panda, Reverse CTF is where your team brings your team flag to the enemy base. It sounds kinda stupid, but it has to be fun. Reverse capture the flag is one flag, and both teams try to get it.